Find the first charge listed on the credit card statement. Mark the charge as cleared. Charges are listed in the left list box. If you charged a bunch of stuff, scroll through the transactions listed in the Charges window until you find the charge. After you see a charge that appears on your credit card statement, click it. Or select the charge by using the arrow keys and then press the spacebar. Quicken adds the check mark symbol in front of the list entry in the Clr column to mark this charge as cleared and then updates the cleared statement balance. If you can’t find a charge, you probably didn’t enter it in the Quicken register yet. 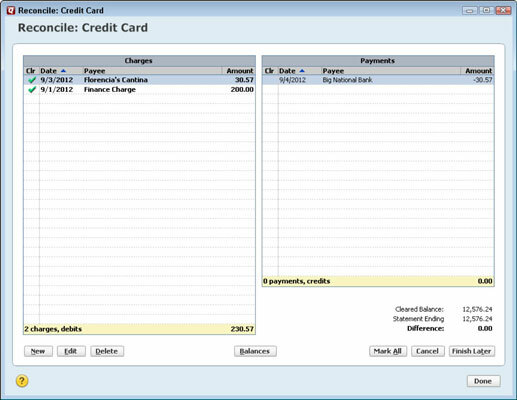 Open the credit card account register by clicking on its tab and then enter the charge into the register in the usual way — except enter a c (the letter c) into the Clr column by clicking in the Clr field. By doing so, you identify the charge as one that’s already cleared. After you finish, click the Return To Reconcile button to return to the Reconcile: Credit Card window. Repeat Steps 1–3 for charges listed on the credit card statement. Or until you’re blue in the face. Find the first payment or credit listed on the credit card statement. Any payments and credits appear in the right list box. Mark the payment or credit as cleared. Scroll through the transactions listed in the Payments window until you find the first payment or credit and then select it. Or select the credit and then press the spacebar. Quicken adds the check mark symbol in front of the list entry to mark the payment or credit as cleared and then updates the cleared statement balance. Enter any missing payments or credits. If you can’t find the payment or credit, it means you haven’t entered it into the Quicken register yet. Open the credit card account register by clicking on its tab, and then enter the payment or credit into the register in the usual way, but put a c in the Clr column. When you finish, click the Return To Reconcile button to return to the Reconcile: Credit Card window. Repeat Steps 5–7 for payments or credits listed on the credit card statement. As you’re looking through the credit card statement, you may discover that you incorrectly recorded a transaction. If this happens, display the credit card register so that you can make the necessary fixes. After you mark all the cleared charges and payments, the difference between the cleared balance for the credit card and the statement’s ending balance should be zero. All you need to do is click Done to tell Quicken that you’re done. Quicken asks you whether you want to make a credit card payment. If the difference doesn’t equal zero, you have a problem. If you clicked Done in spite of the problem, Quicken displays a message that has some cursory explanation as to why your account doesn’t balance. This message also tells you that you can force the two amounts to agree by pressing Enter. Despite the ease of making adjustments, you should still correct the error responsible for the difference.